The L-Word (No, I do not mean lesbian!) – LAUNDRY. This is the bane of my existence. –noun 1. a person or thing that ruins or spoils: Gambling was the bane of his existence. I realize that this is whiny, self-centered and borders a little on the ridiculous. As “banes” go, laundry doesn’t compare to let’s say, cancer, homelessness, animal/child abuse, etc. But, I’m going to digress to a childlike egocentricity and whine about laundry. What can I say? I HATE laundry. I guess I’ve never really met anyone that likes it, but I don’t go around asking people about it either. I would rather go to the grocery store (remember, I hate grocery shopping) for 48-hours straight than do laundry. There are 5 people in my family, but you would think that we have a family of 10-15. We generate dirty clothes like rabbits spawn kits (official name of a baby rabbit – you learned something new today!). I do at least TWO loads of laundry EVERY day (see Deja Vu (again!) post). I suppose, as The Mom, being the laundress of the family is an assumed responsibility listed under The Official Mom Job Description (it leaves out laundry specifically but I’ll assume it would be lumped in with Janitorial Work). I really hate the accolades I constantly receive for doing this chore (it’s really just embarrassing, I mean I’m just doin’ my job) – “Mom, where are my favorite jean shorts?! I put them in the laundry a week ago! They’re not clean?! What am I going to wear?! [daughter stomps off with huffy breath]. When I get the bins cleared out and pat myself on the back for a job well done, something God-Aweful happens! I turn my back for one second and the bins are overflowing with dirty, smelly clothes again!!!! I think the kids hoard their clothes in their rooms on purpose and then BAM! refill the bins to overflowing just to make me crazy. I can NEVER check this chore off of my list. I am a list-maker of the highest order and obtain an instant high when I can cross something off the list – laundry is a buzz-kill. I hate gym uniforms. The Sunday night 10pm gym uniform emergency is getting really old. “But, mommy, I’ll get a demerit if I don’t have my uniform! !” [huffy breath from daughter also verging on tears]. I know what you’re thinking, let her suffer the consequences, blah, blah, blah. Who will really suffer here? Moi. Trust me, there will be other skirmishes worthy of mortal combat. Right now, I’m sure all of you are thinking, “She has two teenage daughters so why aren’t they doing the laundry?”. Okay, this is a quandary for me because as a confirmed control-freak, it has been hard to give up the this drudgery. I’m my own worst enemy. Why? I would like my clothes cleaned properly without shrinkage or bleeding. I would like my clothes done in a timely manner. If I waited on my daughters (who are hardly ever home) to do the laundry, we would all be naked. And, I’m pretty sure that violates all school and workplace dress codes. They will have a lifetime of their own dirty laundry to deal with (now, I’m being altruistic. Okay, maybe not, the control freak in me is being an enabler – wow, I think I need some serious therapy). Now that I got that off of my chest, I will stop whining about it and move on to something else! 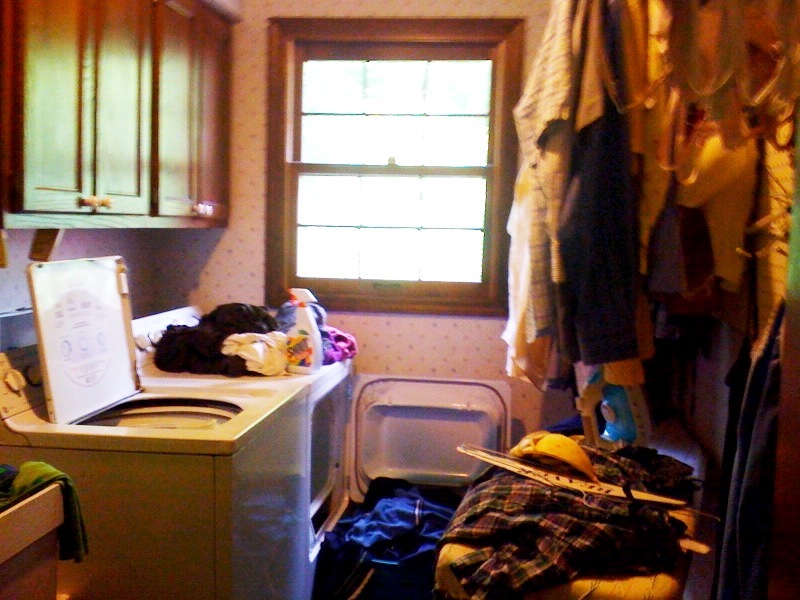 This entry was posted in Everyday Life and tagged bane of existance, dirty laundry, laundry, whining. Bookmark the permalink. ← Shhh… Mommy is Watching her “Bloody” Show! We have a simple rule in my house. Laundry is the job of the person who wears it. Period. It’s not like “I’m the man, you’re the woman. Do my laundry!” I don’t roll that way. So in the five years we’ve been together I’ve never once asked my wife to do my laundry. If it ain’t done, it’s my problem. Period. I do laundry with minimal effort. Since I happen to think wrinkles are the “new cool” that means I can leave my shirt in the dryer for weeks at a time. They just get cooler with each passing day! That’s something to consider. I would be okay if they ruined their own clothes! My husband used to do the laundry, but then I sorta kicked him out of the laundry room – it was the control thing!